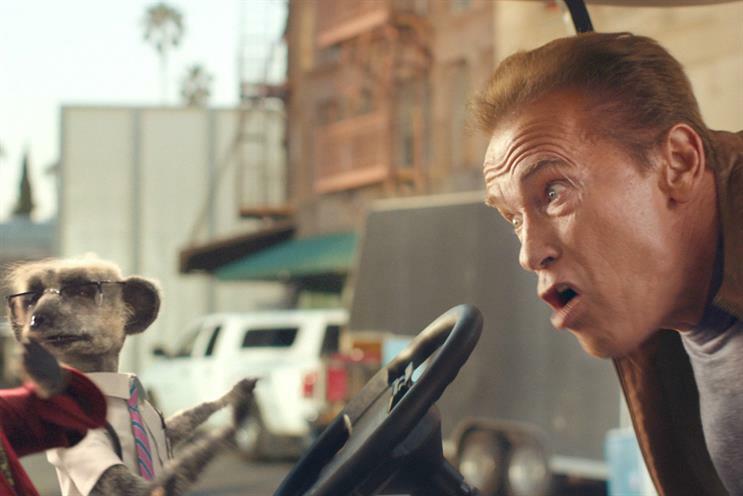 Comparethemarket.com's meerkats bump into the action movie star Arnold Schwarzenegger in a new ad promoting the company's two-for-one cinema ticket deal. The new UK TV spot, created by VCCP, opens with meerkats Aleksandr Orlov and Sergei touring a Hollywood movie set in a stolen buggy and talking about Comparethemarket.com. Aleksandr and Sergei hit Schwarzenegger with their buggy, causing the former governor of California to spill his coffee and scream at the pair to "get out!" The ad promotes the company's two-for-one cinema ticket offer, which will be available on Tuesdays and Wednesdays for one year. The work was created by Matt Hynds and Liam Wilson and directed by Darren Walsh through Passion Pictures. Schwarzenegger vs Stallone: Whose ad is better?